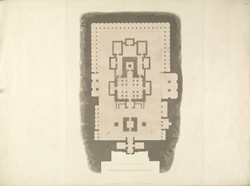 Plan of the Kailasa Temple at Ellora engraved by Thomas Daniell after the drawings of James Wales from 'Plans of] Hindoo Excavations in the mountain of Ellora' published by Thomas Daniell in London in 1803. Ellora is famous for its series of Hindu, Buddhist and Jain cave temples excavated into the rocky façade of a basalt cliff. The works were carried out under the patronage of the Kalachuri, the Chalukya and the Rashtrakuta dynasties between the sixth and the ninth centuries. The Kailasanatha is a free-standing temple rather than a cave, entirely sculpted out of a great mass of basalt. This royal monument was patronized by rulers of the Rashtrakuta dynasty from the mid-8th century. The temple symbolizes Mount Kailasa, the abode of Shiva.